Step off the beaten path and head to Ash Meadows National Wildlife Refuge and Battlefield Vegas. 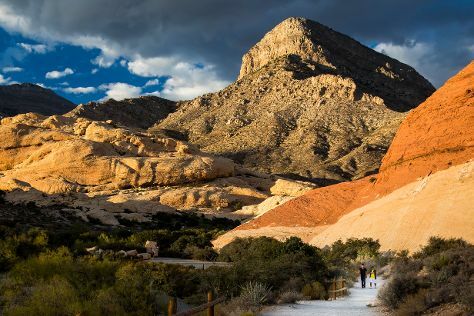 Escape the urban bustle at Red Rock Canyon National Conservation Area and Little Finland. You'll find plenty of places to visit near Las Vegas: Henderson (Sloan Canyon National Conservation Area & Lion Habitat Ranch) and Grapevine Mesa Joshua Trees (in Meadview). Spend the 27th (Wed) exploring the stark beauty of Escape Adventures and Las Vegas Cyclery. Spend the 31st (Sun) riding across the waves with a waterskiing or jet-skiing adventure. And it doesn't end there: don't miss a visit to Bellagio Fountains, get a taste of the local shopping with The Strip, try your luck at Bellagio Hotel and Casino, and take your sightseeing to a higher altitude at Mount Charleston. To find photos, where to stay, and more tourist information, read Las Vegas journey app . In March, daytime highs in Las Vegas are 74°F, while nighttime lows are 52°F. Finish up your sightseeing early on the 31st (Sun) so you can travel back home.